Alea of Premeditated Leftovers and I want to welcome you to our weekend blog hop, The Gallery of Favorites, a place for you to feature favorite posts from your own blog. Although Alea and I both spend a lot of our time writing about food, we do have many other interests and know that our readers do as well. 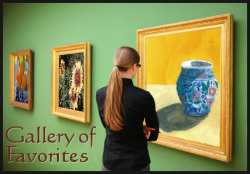 The Gallery of Favorites is a place for all bloggers - not just food bloggers - to share their ideas, interests and passions.